Recently I wrote that San Joaquin Valley -- source of most of the wine made in North America -- makes nothing of interest for wine lovers. That I knew of. A few days later, I heard about the Superbloom in Death Valley, a rare event when wildflowers that lay dormant for years suddenly burst into life after a rainy winter. Because California has been in a 4-year drought, last winter's rains awakened enough seeds to make it the largest Superbloom since 2005. I love Death Valley and had never seen the wildflowers, so my wife and I grabbed the last available hotel room all month. Then I looked at a map and realized, hey, San Joaquin Valley is on the way. So I contacted Ray Krause, one of the San Joaquin Valley winemakers who dissented on my negative blog post, and asked if we could visit and taste some wines. Not only was Ray willing to give up his Saturday to host me; with practically no notice, he rounded up a few other winemakers so I could taste the artisanal side of San Joaquin Valley wines. The drive was pleasant enough -- actually that's a lie, State Route 99 is an ugly highway with billboards for pesticides and for how you're going to Hell, in some cases if you get an abortion and in other cases just on general principle. Along the highway we passed some enormous industrial vineyards. We thought we would stop for lunch before we got to Ray's winery, Westbook Wine Farm, but we passed up the chance to eat at Denny's or Sonic or the gas station after the exit ramp and then for many miles there weren't any restaurants or taco trucks or anything (thankfully we had a full tank). In the place where America gets its bagged salads and almonds and fruits of all kinds, it's surprisingly hard to buy lunch. So we got to Westbrook an hour early, no lunch, and only at this point did I consider: there's going to be a group of winemakers here, and I just dissed their whole region. And I'm out here in the middle of nowhere and the only people who knew I came here are my wife, who's with me, and these winemakers. "I thought you were right about everything," Idle Hour owner/winemaker Anna Marie Dos Remedios told me that evening over a good steak with her fine San Joaquin Valley wine at Sweetwater Steakhouse in Oakhurst, just outside Yosemite National Park. She wasn't the first of the winemakers to say it either. Nobody knows better that most of the wine coming out of San Joaquin Valley is heavily manipulated, boring corporate product than the extremely small community of winemakers who are trying to do something different. I buried the lead. There are a few very good wines being made in the San Joaquin Valley: wines oenophiles would like. They exist. It only takes a few to prove that it's possible. Unfortunately when I say "few" it's an understatement. Most are made in extremely small quantities. Just 40 cases were made of my favorite white wine; only 160 cases were made of my favorite red. The vast oceans of boring wine here overwhelm the tiny creek of good stuff. But of course it's possible to make good wine in California's Central Valley! There are mountains of grapes! One of the best viticulture and enology schools in the world, Fresno State, is here, and its rival UC Davis is just a short drive north. It turns out the universities aren't helping. They're like cooking schools that teach people to make potato salad for a cruise-ship buffet. "When we left Fresno State, we were told we would not be taken seriously if we stayed here," said Nick De Hart, owner/winemaker of Karine Wines. 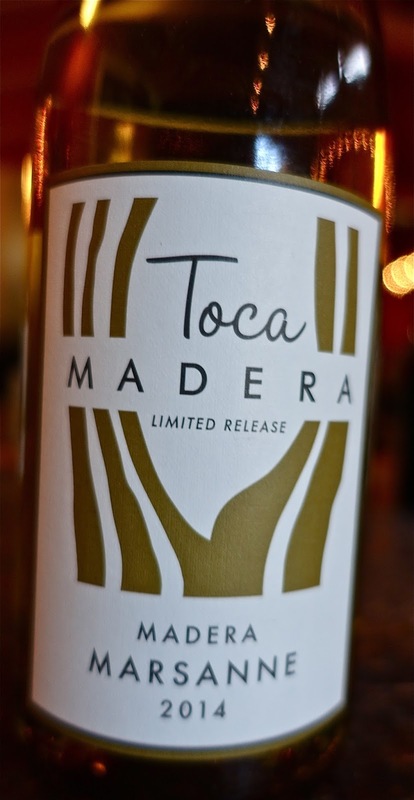 "And I believed it," said Shayne Vetter, winemaker for Toca Madera. Vetter and De Hart both make elegant wines with surprisingly low alcohol. They're not ideological wines; that's just the kind of wines they like. They think the reason more people don't try to do this is because the Central Valley lacks pride. It's not Napa or Sonoma, where clerks in Starbucks will tell you how great their county is. "Nobody came here because they wanted to," De Hart says. "They came because they had to. My family came because of the dust bowl. My wife's family came from Armenia. They had to come because of genocide. There's no pride in this area. I think that's because of where people came from." So when people tell grape farmers their region simply isn't capable of making great wines, they nod their heads and do whatever Gallo asks. "It's people being told over and over that this is the craphole," Vetter says. "If you pay attention to every little thing in the vineyard and the winery, I think you can make Viognier and Marsanne here as well as anyone. But people don't do that because they don't think it will matter." In fact, Vetter's Toca Madera Marsanne is a challenger to Qupé for the best California Marsanne I've ever had: it opens with lime fruit, has some savoriness like raw Italian ham, and excellent texture. It's just 12.9% alcohol, and you might think that in the hot Central Valley, that means the grapes are underripe, but that's not true at all. Yes, it's $35, but well worth it -- if you can find one of the 480 bottles made. Avoiding overripening in the valley heat is actually not that difficult with the right grape varieties, says De Hart, who makes a nice Chenin Blanc at 11% alcohol. Farmers don't believe it's possible so they don't even try to do it. "People in the valley will say, 'If it's only at 20 (brix), I'm not even going to look at it'," De Hart says. "I'm out there every day, watching the acid." Krause says that picking grapes before they're overripe will actually cost farmers money. "Most farmers are asked three things: color, sugar, yield," Krause says. More, not less, is the right answer for all three. Avoiding overripening, though, is the key to making honest wine for wine lovers, because once the grapes come in with 17 percent (or more) potential alcohol, that starts the cycle of technical and chemical manipulations that I complained about in my last post. "The grapes that I buy, I can't buy better grapes at any price," Krause says. But he says less than 5% of the farmers in the valley will even listen to what he wants. Here are the best wines I had from the San Joaquin Valley in my one-day visit. I encourage you to support these wineries. If other wineries learn that consumers are paying a premium for wines of quality from the San Joaquin Valley, that's a step to turning around the wine culture. To giving some pride to a region that needs it. To changing "The Grapes of Wrath" into "The Wines of Delight." These are in the order I tasted them, not order of preference. Read the notes (psst: there's more story in there too) and see what appeals to you, because you are an enophile, not a points chaser. Nick DeHart has access to two rows of Chenin in Lorne Freeman's Freeman Farms vineyard, and he keeps a close eye on those after veraison. He picked the grapes at 19.5 brix, unheard of in the Central Valley, producing a well-balanced wine with stone fruit and gravelly flavors with notes of pepper. Mailing list only (sorry, the website is here). Flowery, yet with more palate weight than you expect from the aroma. A nice aperitif wine. Mailing list only (sorry). Made with 72 hours of skin contact, this delicious and interesting wine has excellent texture, and is the best white wine I have tasted from San Joaquin Valley. So naturally only 40 cases were made. The good news is it hasn't been released yet so you might be able to order it in advance from the winery website. The website is here. Toca Madera has a tasting room open on weekends if you're in the area. Bring your own lunch. Vetter blended 57% of his early-picked Marsanne (20 brix) with 43% Viognier that he picked "past ripe. (26.5 brix) I want to use that as my tool to attract people," he said. "The Viognier is fat. The Marsanne's thinner with a little more acidity." It works: the wine has a tense green fruit note on top with good palate weight. Complex and satisfying. Like the Marsanne, not released yet, but should be available on the winery website. "I originally thought, Zinfandel, it's gonna be a bear," Vetter said. "I thought, I should process this like Pinot Noir." It's 30% whole cluster, no temperature control, older barrels. And it shows: it's surprisingly light in color, light even for Pinot. It's also light and pretty on the palate, with some saltiness on the finish. It's a delicate Zinfandel, two words you rarely see in the same sentence. I wish more Zinfandel was like this. Also pre-release. This Malbec successfully sits on the knife-edge of ripeness that is so rare to find in Malbecs from Argentina. It has deep cherry fruit but a relatively light body, and while it's not tremendously complex, it has nice mouthfeel. Also pre-release. A single-vineyard field blend of the six main Bordeaux red varieties, this is an aromatic wine with cassis, fresh herb and floral notes on the nose, and dense fruit flavors and good complexity on the palate. It's fairly tannic and is best decanted, and might be one of the few San Joaquin Valley wines worth putting aside for a few years to see what happens. The 2009 (I didn't try it) is available from Amazon of all places. Bright berry fruit on the nose, with good complexity and even a few surprising green notes on the palate. Thick tannins. Forbes writer Katie Kelly Bell picked the 2010 as one of her 10 favorite wines of 2015, but her story ran long after the '10 sold out: that's the nature of small-lot San Joaquin Valley wine. I tried the '10 but personally I prefer the '12. This wine is available on Wine-Searcher. This is the kind of fine wine that could be made all over San Joaquin Valley, but isn't. It's a heat-friendly Portuguese red grape treated gently by Dos Remedios, who learned winemaking from Josh Jensen at Calera and says "my style is minimalist." It's refreshing and lively, with nice red berry fruit and some salinity. There were a lot of bottles on the table and this is the one that emptied. You can buy it on Wine-Searcher -- and you should. Clarksburg isn't in the San Joaquin Valley for wine classification purposes; like Lodi, it's a little cooler, so I shouldn't include this wine. But I liked it a lot (it's also available on Wine-Searcher) and I'll use this space to quickly tell Dos Remedios' story. She was a photographer for the San Jose Mercury News who bought the Hollister Pinnacle newspaper in 1999. That's how she met Calera's Jensen; a colleague wrote a feature story on him. They became friends and started having dinner regularly, which led to her being interested in home winemaking. When she sold the paper in 2004 she started working at Calera. "Then I got to (UC) Davis and found they don't teach winemaking like that," she says. "They say, don't use native fermentation. Don't leave wine on the lees." At first she made wine only with Central Coast fruit, but her partner inherited a hotel in Oakhurst so she moved her winery into a building there. On the night of her first crush in the new winery the hotel was sold out for a Hell's Angels annual retreat, "with everything that goes with that, strippers and the DEA and all that. And the crush took 14 hours because the Viognier skins were unexpectedly thick. Our basket press just couldn't compete with those skins." Artisanal wine isn't always better than big-batch wine, but it's almost always more interesting. So there was, indeed, a very beautiful baby in the bathwater. Thank you for revisiting the topic of what the Central Valley has to offer! Reading this piece, I learned about some cool folks doing creative things in wine. Great job! Thank you for ferreting out some interesting, serious wines in the Central Valley. I have long been a fan of Westbrook Wine Farm but I look forward to tasting the other wines you describe. I would like to add that you probably did not get a fair indication of Fait Accompli. With time, preferably in cellar, but at the very least a few hours in the decanter, this wine opens up like a fine Bordeaux. In fact, it has beaten some of the best Bordeaux in blind tastings. But like Bordeaux, it needs to be handled properly in order to experience its full potential. I'm sorry you didn't taste Westbrook's Peterson Family Vineyards Cabernet. It's fruit forward when young but matures surprisingly well. It seems to hit its stride at about 10 years. The fruit calms down and the structure and minerality become more in balance. Maybe you'll have a chance for a second visit. If you do, also try Ray's rosé. Best I've had outside Tavel. If there is to be a leader of the "Revolution" to honest, "unmanipulated" wines, that would be Ray Krause. His vision is the one point of clarity that you make about the otherwise Industrial Wine Business of the vast Central Valley. Ray does not make a wine that I wouldn't be pround to present to friends and family - and what celebration would not be better with a bottle of Westbrook on the table? "It turns out the universities aren't helping. They're like cooking schools that teach people to make potato salad for a cruise-ship buffet." Big, uninformed mistake here: No university, be it FSU, UCD, SLO, Cornell, Texas Tech, Penn State, Bordeaux, anywhere in the world, none of them, are charged with teaching winemakers how to any style of wine. The charge is to teach chemists and microbiologists, even some engineers, the science behind the art of grape growing and winemaking. This is so they are able to make educated decisions towards whatever style they or their bosses prefer. Every winery has its style and no university could possibly teach the best methodology to achieve a style given the hundreds if not thousands of variables involved with each wine. Fresno doesn't teach students how to make "Central Valley wine" (whatever that is)any more than Davis teaches a North Coast style. Students may make wine as part of the curriculum in a university or college, but the style is secondary to teaching the science behind critical decision-making in a production setting. It is NOT a culinary academy approach. Proprietary style decisions are learned in a vineyard or a winery after the basics have been taught and tested in a classroom situation. Generalities such as the quote above do nothing to dispel these dumb myths. Fresno has an excellent program, as do all the accredited universities and colleges that offer a viticulture and enology major. Don't blame the educators for style decisions made by owners who mostly do the best they can with the fruit they receive. Some good, some bad, but style is the purview of the winery and/or vineyard, not a university, end of story. You forgot to stop at Ficklin and Quady! Long histories at both wineries for port styled wines. Case production is high, as both wineries distribute nationally. I'd add Papagni, too, especially their Alicante Bouschet.